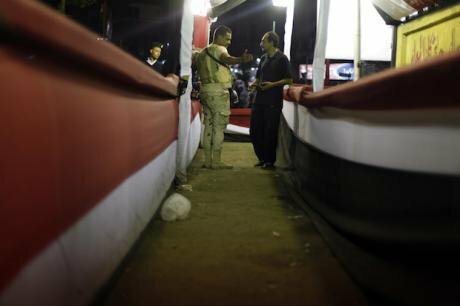 A security member and a voter near a polling station in Cairo, Egypt, on March 28, 2018. Picture by Ahmed Gomaa/Xinhua News Agency/PA Images. All rights reserved. The results of the Egyptian elections are hardly shocking. Sisi has won his electoral "battle" with another pro-Sisi supporter popularly called "Moussa Something Moussa". The hyper nationalistic pro-Sisi musical vans and the desperate attempt to get voters to the polling booths (using monetary rewards, threats and physical abuse) were also hardly shocking. Neither was it particularly shocking to note that some US Congress men and women had knowingly or unknowingly become part of the pro-Sisi propaganda apparatus when they danced at the polling stations. Nor was the relative low turn out, particularly amongst youth, shocking. Yet, in a different way, the elections in Egypt were shocking. Shocking and most of all absurd because of the sheer lack of political content, lack of electoral choice and lack of freedom of expression. Even in the always noisy capital Cairo, it is eerily quiet. There is no political sound or whisper. Rather, repressive political silence permeates Egypt’s busy streets in a stifling and choking manner. Political leaders and electoral candidates were arrested, and placed under house arrest or simply disappeared. Many political activists fled the country and others have a dark cloud hanging above them with therein the anxious question “when will it be my turn? When will I be arrested and tortured? When will I disappear”. It is also shocking because within this dark grey cloud there is always still a faded remembrance, a longing for the 2011 revolution. A remembrance that has now been sullied, covered and smothered by political dissatisfaction and counter-revolutionary betrayal. The 2011 revolution was not so much a call for liberal capitalist democracy with elections – after all, this had long been Mubarak’s corrupted model of politics. Rather, it was above all a call for socio-economic change and an end to security state abuse, because only then is there a possibility for meaningful political change and openness. However, this dream now lies buried under a hug pile of political rubble, upon which the unsteady house of current Egyptian politics is built. Economic inequalities and security state abuses are greater than ever before. Thousands of people have disappeared, been tortured, raped or murdered. Protests or demonstrations are forbidden and even the smallest criticism of the government, military or the “Egyptian image” is viewed as a direct threat to national security. And this, for example, includes a statement that the water of the Nile River is dirty, as the pop artist Sherine recently discovered. She was sentenced to 6 months in prison for this comment. “life is superfluous. It is being thrown away and no one says anything about it. It is the deadening, repressive silence that is the worst. The silence, and waiting, when will it be my time to die?”. Silence and death is also pervasive in the Sinai, which has become nothing short of a militarised black hole. We will never know what truly happens in the Sinai, other than the distorted snippets of pro-state news outlets. In the meantime, the internet and social media are being monitored for terrorist activities with the help of the German intelligence services under the new Egypt-German deal struck by Angela Merkel. This of course includes all human rights activities, which after all harm the image of the Egyptian nation and the regime. Furthermore, civil society has been entirely shut down by the NGO law that closed more than 47,000 organisations. And around 500 websites have been closed – amongst which news outlets such as the Huffington Post – due to terrorist activities. At the same time, France is shipping tons of military hardware to Egypt. And Dutch companies are collaborating in the Suez canal project, which whilemaking a loss, particularly serves to uphold the image and legitimacy of the regime. The Dutch have also risen to the 7th place in arms trades to Egypt, followed by Germany but superseded of course by France. And Britain’s arms trade with Egypt has nearly doubled since 2013, after Sisi got the full “red carpet treatment” during a visit to the UK in 2015. Overall, authorised arms exports to Egypt have risen from 3bn Euro in 2013 to a whooping 19.5bn Euro in 2015. And all because international political leaders believe that the support of authoritarian leaders such as Sisi will bring them more stability within the region. The IMF also clearly shares this belief when Christine Lagarde recently praised the Egyptian government’s reforms and particularly their serious efforts to protect the poor and vulnerable, while of course at the same time pushing precisely these populations further into poverty through the devaluation of the Egyptian pound and the removal of state subsidies. Even an average middle class family cannot afford a simple packet of orange juice, and the cost of a chocolate bar has become the equivalent of a week’s wage. Egypt is a pressure cooker, wherein the Egyptian people are left to rot in their struggle for survival – either socio-economically or in Egypt’s prisons. This one-man-show election will not take away or alleviate those pressures. And meanwhile Egyptian securitisation will not lead to stability but greater instability. It will at some point explode in everyone's faces. The question is when, how and most of all, at what cost. How much more blood will flow?